Qorqup Glacier (Qooqqup) is in southern Greenland near Narsarsuaq. The glacier divides shortly above the terminus into an eastern and western glacier branch. Kuussuup Sermia is a distributary glacier of the Qorqup. 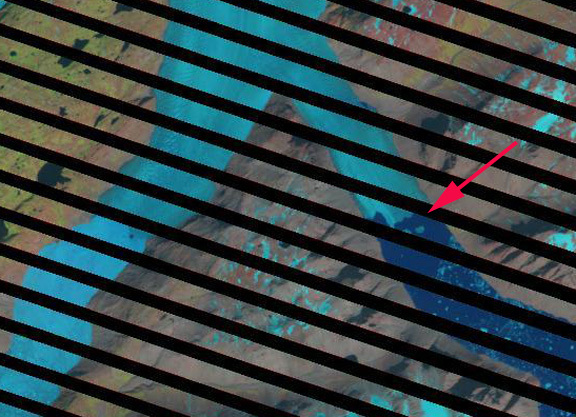 Here we examine Landsat imagery from 1993 to 2014 and Google Earth imagery from 2005 and 2013. The eastern branch terminus is indicated by the red arrow. A series of images from 1993 to 2008 indicate limited terminus change, the red arrow indicates the 1993 terminus position on each image. The main change was the minor retreat on the western side of the terminus between 1993 and 1997, where a 600 m wide and 600 m long area was lost. 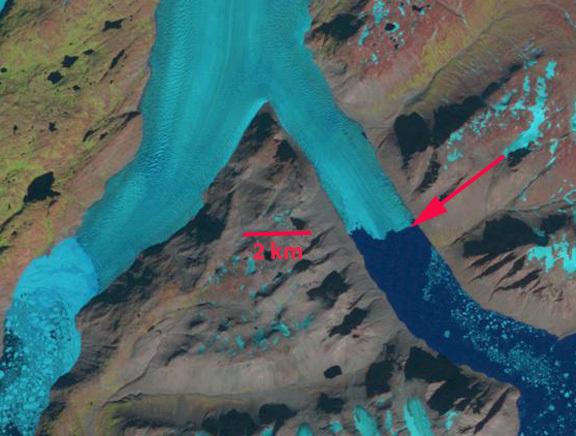 After 2010 the glacier retreated 750 m by 2014. However, in 2014 it is clear that the lower 3 km of the terminus is disintegrating. 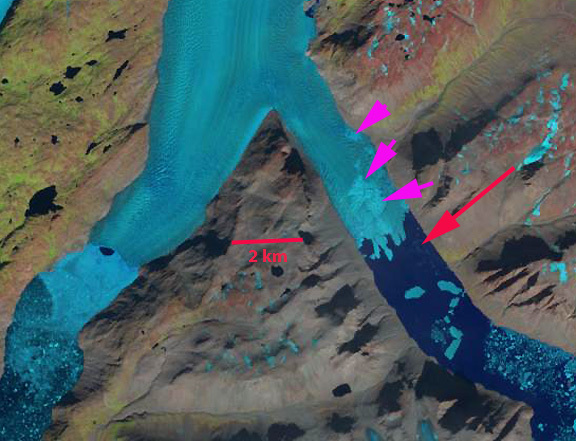 The disintegration is evident at the pink arrows, with both rifts and iceberg melange sections evident. The Google Earth imagery from 2005 and 2013 indicate a vast change in the character of this terminus reach. In 2005 the terminus is still at the same location, red arrow. 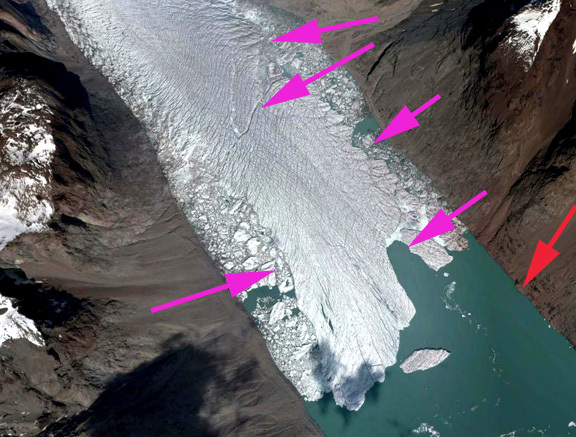 The pink arrows indicate crevassing that indicates rapid glacier flow, there is no significant rifting or melange at that time. 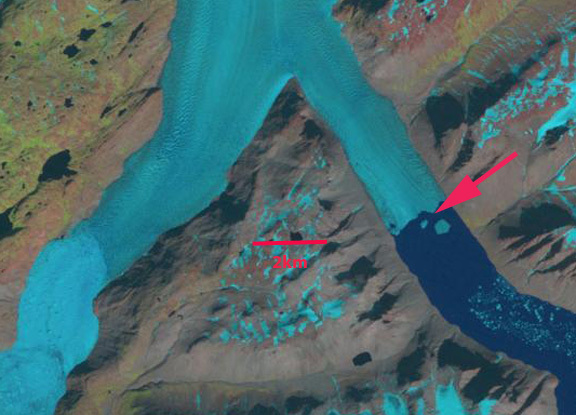 By 2013 the glacier has retreated from the red arrow at the 1993-2010 terminus position. More importantly each pink arrow indicates an substantial rift or ice melange. The glacier tongue is no longer in contact with the valley walls in its last two kilometers, three kilometers on the east side. 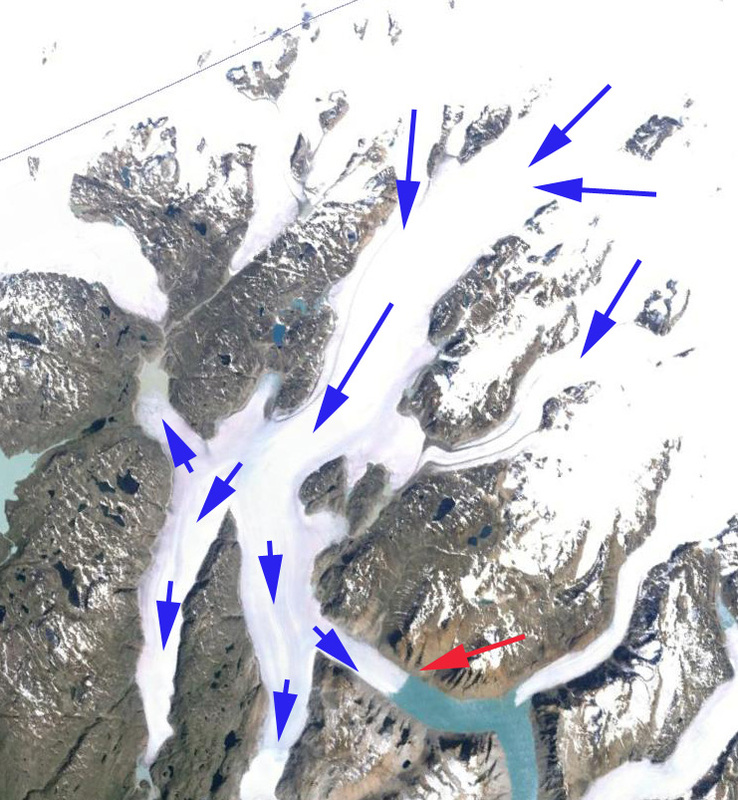 There is also a large rift two kilometers from the ice front, indicating a location where the glacier will separate. 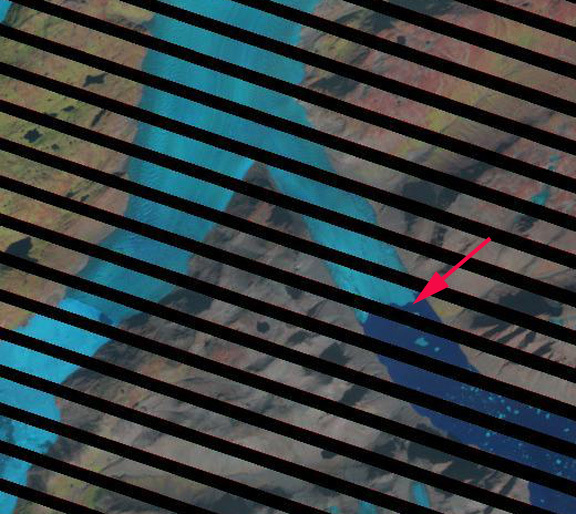 This rift does penetrate to the water level. The retreat of this glacier is similar to that of Narssap Sermia and Qaleriq Glacier. 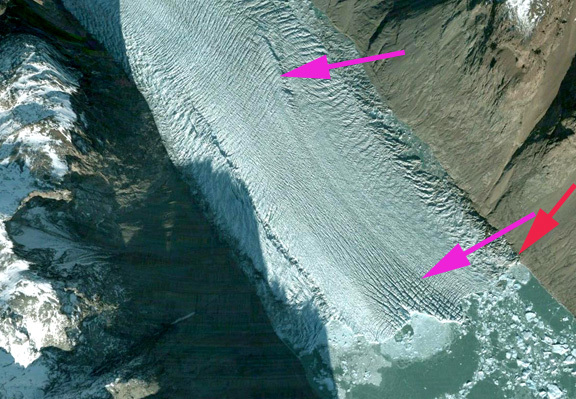 The rifting leading to calving is what was observed on Petermann Glacier. This entry was posted in Glacier Observations and tagged greenland glacier melt, Greenland glacier retreat, greenland glacier rifting, greenland glaciers global warming, Qorqup glacier retreat. Bookmark the permalink. Also to be noticed, both branches are getting narrower since 1993? That is the thinning, which leads to narrowing and then rifting as the ice thins.